I am still not sure why but there are a few items (ear simulator) that I can't choose to ship by air but is made possible when I choose the option to ship by sea. This is my first time shipping by sea, I usually don't ship by sea because it usually takes longer for the parcels to arrive (5-10 days VS 15-25 days). But this time round, I don't have a choice. 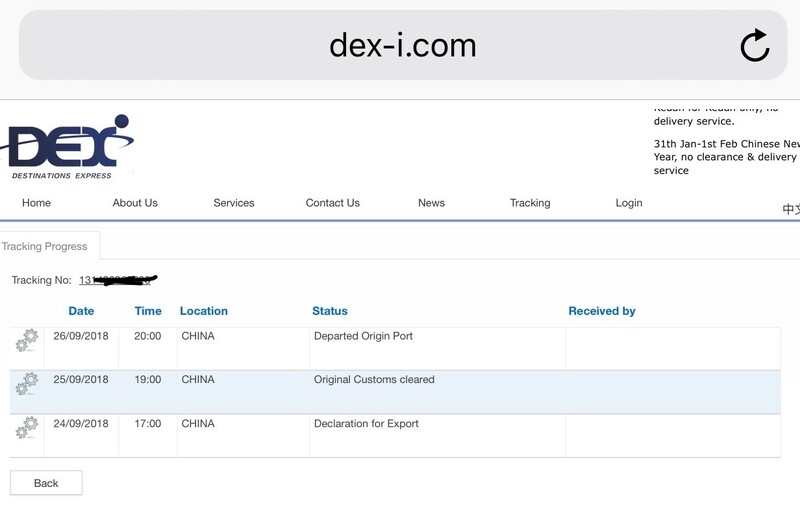 I went with Taobao Official Sea Shipping (which happens to be DEX-I Destination Express International) instead of Lazada. Lazada has too many negative reviews and adds up to be slightly more expensive. The items I bought added up to over 7kg (which would be rounded up to 8kg). 8kg = RMB26 + 8(9.4) = RMB91.80. However, I was charged RMB126.28 due to a 7% GST tax of RMB34.48. 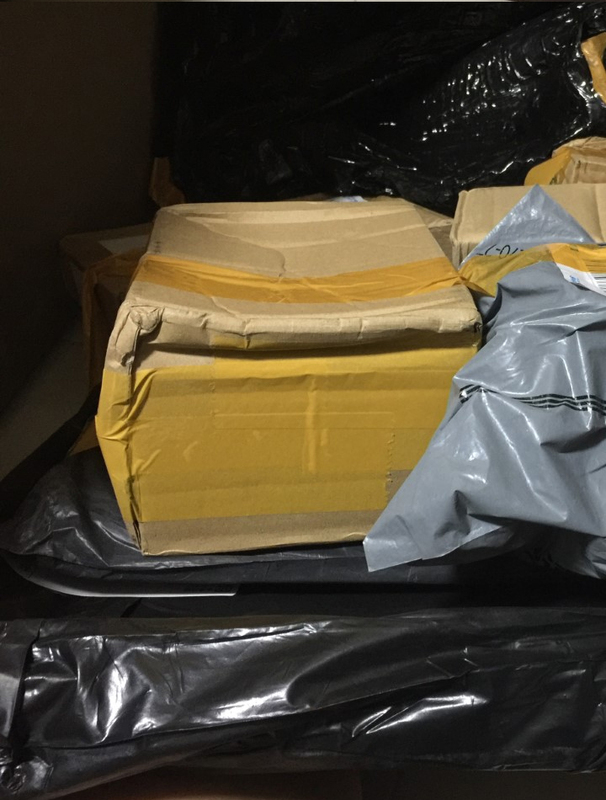 (Note: GST doesn't apply to air shipping IF items total value did not hit SG$400). 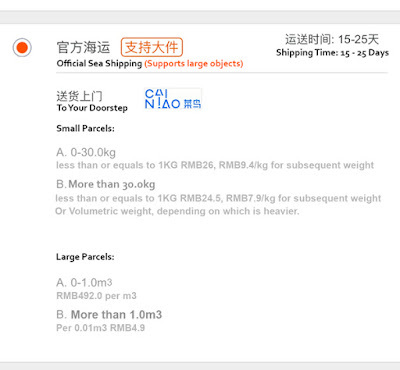 However, RMB126 is still cheaper than RMB143 if I ship by the cheapest Taobao Appointed/Official air forwarder. 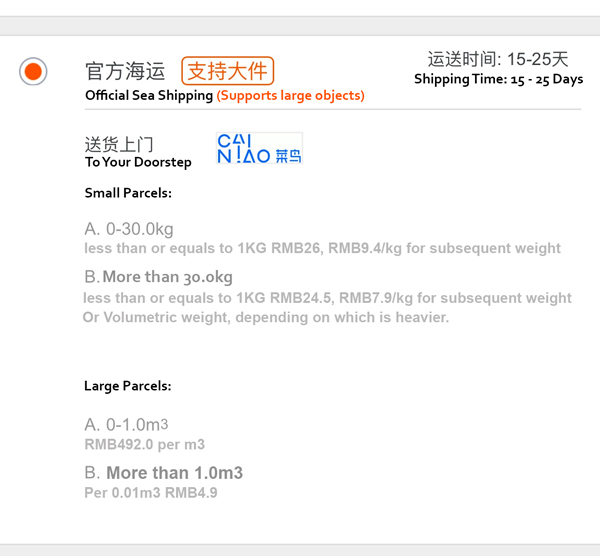 (If I've choosen Lazada sea shipping, it'd have cost RMB$116 excluding GST). 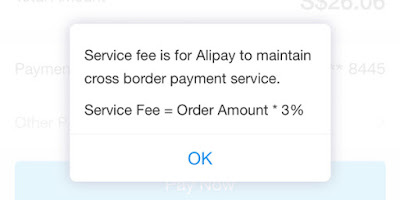 And there is a service charge of 3% by Alipay (which occurs on every payment you make). I'm not too happy with the sea freight CS department. 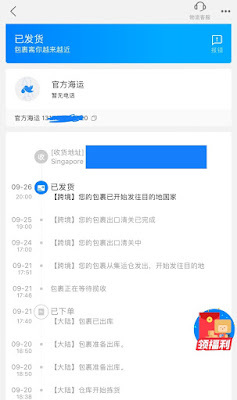 When I enquired about shipping items with battery, they couldn't answer me and asked me to baidu (China's version of Google) it myself. what is the Customer service department for! (around 14:00-15:00) Items were consolidated and shipment fee paid. Well, it took 15 days to reach me, well within the stated time frame, no complains here! The application allows you to track every single item you bought on Taobao (if you link them up). And there are options to win coupons and stuffs. But I won't go into details. 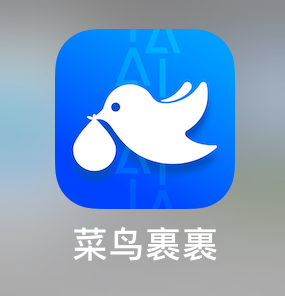 This application will show the same information as Taobao (I think Taobao draws information from Cainiao) but the app updates faster. The next option, is tracking via the Dex-i website. 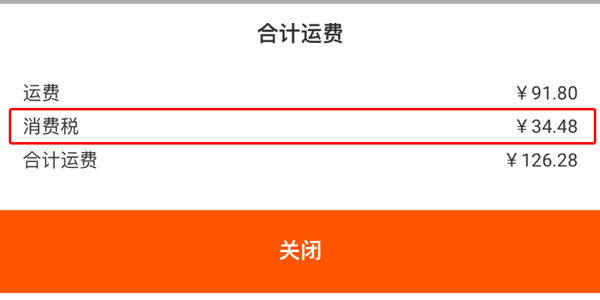 The website is available in both English and Chinese, so it might be easier for some. I captured this on 22 Sep, there is no way they could have updates of 26 Sep. Unless, it is a prediction? Anyway, similar with most tracking system, information will only be updated when the parcel reached a new "destination" (or port) and processed hence there will be days that there is no updates at all. For my case, I do not have updates since 22 Sept and then on 05 Oct, everything is updated at one go. So there is no way you could contact the local delivery agent to arrange the delivery. 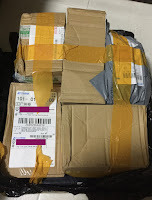 I think the conditions of the individual parcels are quite acceptable. I've a few screen protectors (including large ones, 19 inch) and they're in good condition. But I'll leave it for you to judge. But once again, I must make it clear that there is no way of knowing when the parcel was damaged. Before they reached the warehouse or after. The local Delivery Agent is Last Mile Delivery Pte Ltd, which is a new company setup in February 2018. I've tried contacting them via their online chat, during working hours but it seems like there is no one there to answer. I'm pretty happy with Taobao Official Sea Shipment. They're pretty fast and parcels arrived in acceptable conditions. If your item is bulky, you probably could ship by sea only. If you can't wait, don't ship by sea. Sea shipment takes typically 15-25 days! Air would take about 5-10 days! 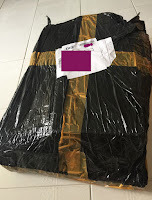 Some items can't be ship by Taobao official air shipment, you can go through sensitive air shipment though but that would requires you to find your own forwarder. I've cover some of them in my PingAn International Express (Taobao forwarder) Review and Lazada (Air) Shipping and Shipping Sensitive Items from Taobao!) However, some sensitive items can't be shipped by sea also. Don't ask me what can't be, I'll just ask you to "baidu" yourself! LOL. Maybe you should try sea freight services by Metro Combined logistics. Great article, that you have shared here about the freight forwarding. After reading your article I got very much information and it resolved many of my doubts. If anyone looking to Send parcels to Pakistan, Pak Direct Cargo is the best for you.